Edinburgh Capitals missed their chance to move off the bottom of ice hockey’s Elite League when they were swept aside 6-0 by Dundee Stars on Tayside last night. A miserable second period from the visitors in which they conceded five goals ensured what had been a feisty even encounter was transformed into a one-sided romp. With Stars’ power-play clicking into gear there were a perfect three goals from three opportunities in a nightmare 20 minutes for Edinburgh. Edinburgh bench coach Jock Hay was soundly disheartened following the performance and said: “I remember saying earlier in the season this team would win more games than we lose, how wrong could I be? “These guys are good hockey players but we’ve never gelled right from the word go. At least earlier in the season when we went down in games we showed some fight to get back into it, but recently when we go a few goals down, rather than stepping up and trying to get it back, we just get worse. We never looked like scoring, even if we had played all night. “The second period was shocking, our penalty killing was awful. In fact the whole performance was very poor. We had a seven minute power-play and managed two shots on goal, but it was the second period that killed us. We lost two early goals there and they were bad ones to lose, and the guys looked from that point on like they had no confidence to get it back. Match referee Toby Craig was forced into handing out 43 minutes of penalties in just seven minutes of playing time as scores from Saturday’s 3-2 Edinburgh win over Dundee at Murrayfield were still being settled. The focus point of Dundee’s aggression was Sean Beattie who was involved in early altercations with Stars’ Justin Faryna and Craig Cescon resulting in seven minutes of power-play time for the visitors. Edinburgh could do little with the extra man, aside from an Ian Schultz effort that hit the post. Then in the second period, a hockey game broke out. Unfortunately the hockey was only being played by one team, Dundee, who were on the board 30 seconds after the restart. Caps netminder Travis Fullerton could not hold a Kevin Hart effort, Mikael Lidhammar scoring on the rebound. Mason Wilgosh hit the post for Edinburgh before a lovely individual effort from Stars’ Brett Switzer doubled their lead, taking the puck around Jay King and firing a powerful wrist shot into the top right hand corner. Edinburgh then ran into penalty trouble of their own with transgressions from Garrett Milan, Karel Hromas and a bench penalty for too many men on the ice, all being punished. 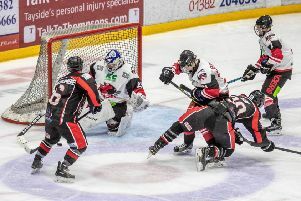 Matt White scoring twice after being left unattended in front of Fullerton, before a similar lacklustre effort from Edinburgh resulted in a goal scored by Faryna. As the game quickly turned from Mean Streets to easy street for Dundee. Faryna, with his second of the game, scored Dundee’s sixth and the only goal of the third period. Caps now find themselves seven points outside of a play-off spot after a superb weekend from eighth placed Coventry Blaze, Danny Stewart’s outfit who currently occupy the final play-off place picking up wins over Cardiff Devils and Nottingham Panthers.